Roughly a week before the FBI conducted searches of her home and two of her husband’s offices, the wife of City Councilman Jose Huizar resigned from the Los Angeles Commission on the Status of Women, which held its first meeting Friday since she stepped down. The commission’s members are appointed by Mayor Eric Garcetti, who submitted a letter on Oct. 31 to the City Council appointing Francesca Vega to fill Richelle Huizar’s seat. About a week later, more than a dozen FBI agents showed up at City Hall armed with a search warrant and seized numerous boxes and bags of potential evidence from Jose Huizar’s office, while also searching one of his field offices and the Huizars’ Boyle Heights home. The resignation could be related to the announcement in September that Richelle Huizar is running to fill the seat of her husband, who has served on the City Council since 2005 but is prevented from running again due to term limits when his current term expires in 2020. It is common practice, although does not appear to be required policy, for city commissioners to resign their post if they announce a run for public office. Councilwoman Monica Rodriguez resigned her seat on the Board of Public Works shortly after announcing her City Council candidacy in August 2016, and Heather Repenning also resigned from the Board of Public Works and served her last official day earlier this month after announcing her candidacy for the Los Angeles Unified School District Board of Education. No arrests have resulted from the searches, and the FBI has not commented on what agents were seeking. Neither of the Huizars have publicly commented since the searches, and an attorney representing the couple did not respond to a request for comment on Richelle Huizar’s resignation from the commission. Garcetti’s office confirmed that Richelle Huizar resigned on Oct. 30, but did not respond to a request for comment on her resignation, which does not appear to have been publicly acknowledged or announced either by the mayor’s office or Richelle Huizar other than the letter to the council, which is a publicly available document. Garcetti also did not respond to a request for comment on the FBI searches. Richelle Huizar had served on the Los Angeles Commission on the Status of Women since last year, and previously served as both a policy director and later as the assistant executive director of the Commission for Children, Youth and Their Families. 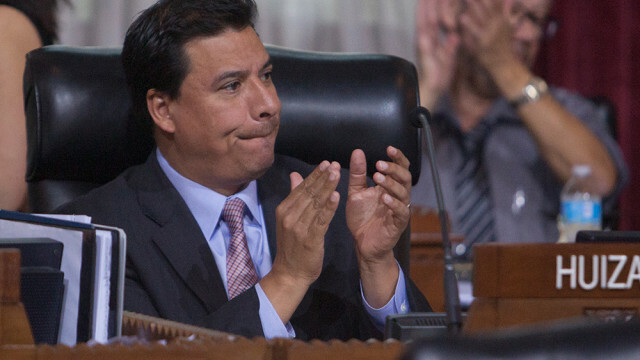 On Thursday, Jose Huizar was stripped of all of his committee assignments by City Council President Herb Wesson. “We’re optimistic Angelenos will be best served by these changes as the Los Angeles City Council continues the people’s work without interruption,” Wesson spokeswoman Vanessa Rodriguez said in an email to City News Service about the move, offering no further comment. Jose Huizar was recently targeted in two lawsuits filed by two former employees, both of whom accused him of ethics violations and other misdeeds, although it is unknown if the FBI searches are related to the lawsuits. One of the complaints was filed by Mayra Alvarez, who was Huizar’s executive assistant and scheduler for about three years. In her suit, Alvarez, who contends that she left in July because she was demoted after returning from maternity leave, accuses Huizar of doctoring his schedule to hide certain meetings from the media, along with other ethics violations, including that his staff was pressured to work during city time on planning Richelle Huizar’s campaign. The councilman has denied the claims in both lawsuits. He previously admitted to an affair with former staffer Francine Godoy, who sued him on allegations of harassment and retaliation in 2013. He denied any harassment and the suit was settled out of court for an undisclosed sum. 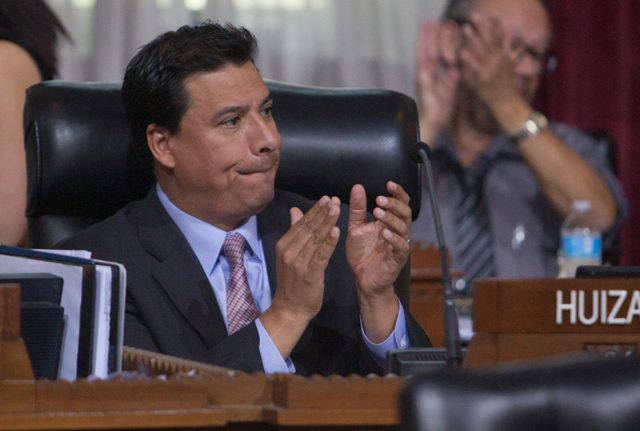 A report from the city’s Special Committee on Investigative Oversight concluded there was no evidence of wrongdoing by Huizar.